Each presentation had a page where the speaker was introduced and the topic described. There was a Hangout on Air video embed there which streamed while the presentation was active and archived and played the recording moments after it was done. As with http://webheadsinaction.org/live, there was a Chatwing embed below that where participants could chat during the presentation and carry on the conversation after the event. The conversation pages were quite active for every presentation and can be viewed from the links at the conference portal, and for the convenience of readers of this blog, at the Recording links below. This was a similar interface to what we use with Learning2gether Hangouts on Air, and it modeled a great interface for attending an online conference. As with L2g events, I recommend to participants that they open the Chatwing text chat in a separate window to the one with the video stream, to be better able to follow both at the same time. This is what it looked like to me. @Edu_Match Share your passion project! 5 Min, 2 slides! 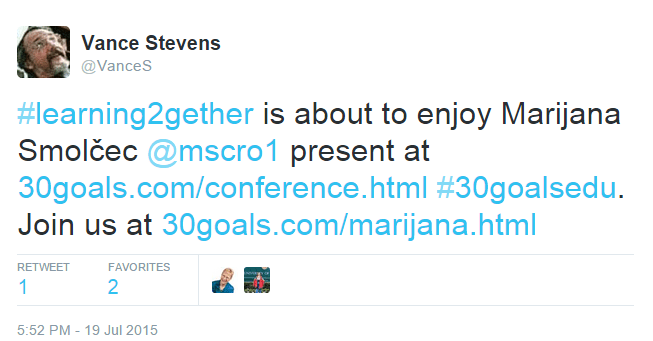 This keynote will be a story of my own experiences and milestones in accomplishing The 30 Goals. With the aim of sharing how I accomplished the ‘Be someone’s champion’ and ‘Plant a Seed of Belief’ goals with my students, I’ll be talking about how my students have become my champions and it’s actually them who’ve planted a seed of belief and enthusiasm in me, as they bring the best of me as a teacher when I see them grow, improve and connect. In this keynote, I intend to share with the audience the successful experience of having students(adult and teenagers) enhance their lexical and communicative skills by collaborating in real time using the app Google Docs in their mobile phones. I will show the evolution of their first drafts and attempts to their current usage and how that has impacted their written and oral production. Are we born with natural talent or can we develop skills with determination and hard work? Drawing inspiration from the book “Bounce” by Matthew Syed, Sylvia will explore this question while she describes her journey from non-artist to sketchnoting fanatic. At its core, the 30 Goals Challenge inspires teacher development individually and as a connected group, in either order and for both ends. This same reflexive process beautifully draws students into their own learning—a reminder this talk will explore and exemplify. The Impact of a Goal & The Vigor to Overcome Obstacles! One of the 1st cycle goals impacted the way my teaching evolved and changed. This keynote unveils this story and illustrates it with practical examples of what transformed in my classroom and motivated me to keep searching for better ways to engage in a 21st century teaching approach, providing the students with 21st century skills. Obstacles? We can handle them, because we are teachers! Critical Moments’ can strike at any moment, often when we least expect them. Recognising and embracing such moments is one of the best ways for teachers to develop. In this talk, David will tell us about four short stories of key critical moments from his career, starting with his breakfast. In this talk, I will explore some basic features of project-based learning and show an example with the fluffy toy Brownie the Bear and its friends. Based on this project, teachers will be able to create and elaborate their own original and creative projects with a mascot of their choice. Music, one of the greatest motivators in class, has a lot of power when we add movement and action. I will provide activities to do in class with different pop songs. In this keynote, teachers will get a glimpse of a balanced teaching practice reflection based on the reality of the educational contexts involved. Teachers will also get the chance to reflect on their own practice (what they did, do and intend to do soon enough), check out their teaching identity (“I am teacher so what?”), reasons for keeping on teaching (Is there any?) and become aware of the changes they are able to make with just a tiny purpose and teaching passion. Teaching must be anchored to a variety of changes led by the context need, providing the adaptability it demands to make of it a teacher-student successful experience despite the cons it faces; resources, payment, low salaries and many other situations can break down all projects, but teachers need to be reminded that those things will not be embraced differently if they do not start making a difference on themselves. Have you ever wondered if texting, tweeting and snapchatting impact our students’ communication skills in the classroom? Well, they certainly do! This session will introduce different social media tools that students use for social communication and will explore the impact they have on their oral and writing communication in the classroom. Effective strategies will be discussed on how to manage this Impact and help students communicate effectively. Join Nikki to learn how she went from a veteran educator in a rut doing the bare minimum to collect a paycheck to a renewed invigorated educator through connecting with Shelly Terrell’s 30 Goals Boot Camp and building a PLN through Twitter. Abran will give a keynote on NuSkool’s method of transforming pop culture into a learning experience. NuSkool finds teachable moments in all forms of entertainment, from TV to music and video games, creating lessons schools can use to engage struggling students. This subscription-based online platform allows teachers to create virtual classes, providing access to lessons based on trending topics that matter most in students’ lives. It’s relevant, real life learning. In this keynote, Rosmery will show you how to teach students the keys to better academic writing- Unity, Coherence, and Cohesion. Participants will walk away with teaching guides and skeletons (writing outlines). Identifying a problem is a great start. Inspiring yourself and others to care is good too. Taking action to solve the problem is often a missing link and one reason why I embrace the 30 Goals Challenge. We’re not here to get ready, we’re here to get started! This presentation aims to share how I’ve achieved the goal of giving students reign by co-constructing our classes. Hear, Share, Ask! introduces three key principles to guide the process of negotiating the Whats, Hows and Whys to learn the language and developing skills. You can grab the moment or you can let it pass. Ditch the plan. How can we take learning to a different level? How can we bring some balance into planning and ditching the plan to bring real life, joy and fresh air into our class? How does trust benefit learning and teaching? We will explore these questions while I will share a story about how an event happening outside the walls of our classroom led us to an unplanned memorable learning moment. This keynote will inspire educators in all roles take positive action to be coaches for others in their schoolwide PLN. All the time I see Educators struggling to survive! Some of us do and some of us don’t. We stop teaching – change careers opt out completely OR we just hang in there! Why, and why, and what can we do to help us survive? Educational silos have been around for about a century. The damage that this does to students is only now being recognised. This session examines the changes that educators must embrace to eliminate that damage. There are various types of classrooms all over the world – their variety lies not only in the environment, but the classes, the educators and students. We know this either from seeing them, or hearing and reading about them in blogs, on social media and in our everyday teaching lives. Some have state-of-the-art equipment and everything an educator and students would dream of. Several have a few things that could assist the class in their learning, colourful walls and children’s work displayed on them. Some, however, have nothing at all, apart from dirt floors and bare walls. Why does this occur? How does this affect learning, if it does at all? What is the most important entity in the classroom? Join me in a journey around the world, where we will be on a quest to search for where the importance lies. Everyone can achieve certain goals set for themselves, whether they are small or big, whether they are difficult or easy, we just need to keep it simple and keep on going. Never give up! In this short presentation we will share some suggestions about how to be a part of the overwhelming, but passionate EDU community. How to share, learn and motivate each other. Students are not fools. They don’t believe the teacher who lets them win a game on purpose or pretends not to know the answer to the question. This talk will examine how we play games when teaching one-on-one, respecting the students but still helping them shine! In this keynote, participants will learn how to help their students become great and responsible digital citizens who share and post online safely. Andre Spang will discuss the 4 C’s of 21st century learning and the Maker movement. PARCC. SLOs. Drowning in the alphabet soup? Learn how to bring new life to your teaching through the one acronym that just may save you, the C.P.R. method. Maximize productivity through COLLABORATION. Bring your PASSION to the classroom. Make your lessons more engaging through REINVENTION. Take a deep breath and dive in. Teachers are often known as people who are always willing to help, go the extra mile to plan and teach lessons that will foster the learning and development of students. But many times that takes a toll, and it’s not unusual to hear about burnout teachers – some go as far as abandoning education altogether. In this talk I’ll share my experience, common symptoms and especially things you can “weave” into a protective suit to keep the “fire” away and prevent burnout. Most of you would agree that being a teacher, does not only have to do with presenting a subject, but also be a role model and make students aware of situations and other people’s feelings. Could we raise students’ awareness? 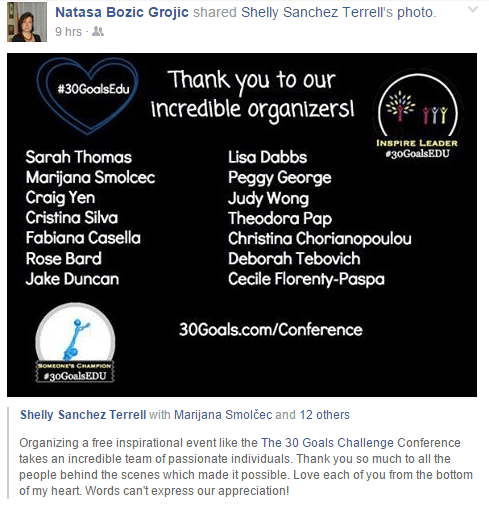 This is a presentation of a #30Goal that started as a blogpost and turned out to be a wonderful event. Teacher Hero, Be Someone’s Champion! 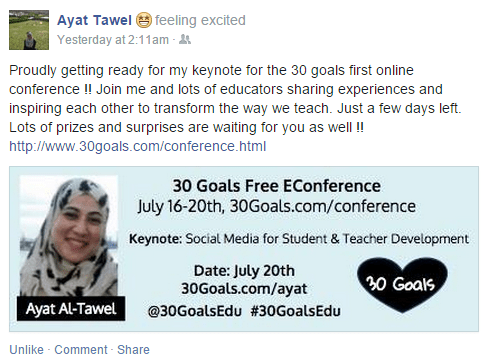 In this keynote, I share the reasons why I joined the 30 Goals Challenge, how much I have grown as a teacher since then, how being part of this community motivates me to go on teaching and innovate, as well as considering myself a continuous learner. Too many students believe they don’t need to learn, or that they can’t learn. Professor Carol Dweck contends that this is due to students developing a Fixed Mindset with regard to their capabilities. Dweck argues that learning is stunted and many social issues can arise by having a Fixed Mindset. She says in order to students to flourish, they need a Growth Mindset – a disposition that embraces challenge, seeks out feedback and values effort as the pathway to mastery. Could a Growth Mindset be the key to unlocking our students potential, and how can teachers and schools cultivate a culture of Growth in their classrooms and schools? In addition to this, research suggests that the teacher’s mindset has a significant impact on the students in their care. How can we address our mindset in order to challenge expectations and improve our ability to recognise potential and learning in every one of our students? In particular we’ll consider the theory behind mindset, as well as strategies for feedback and assessment. participating in networks of other teachers or learners. 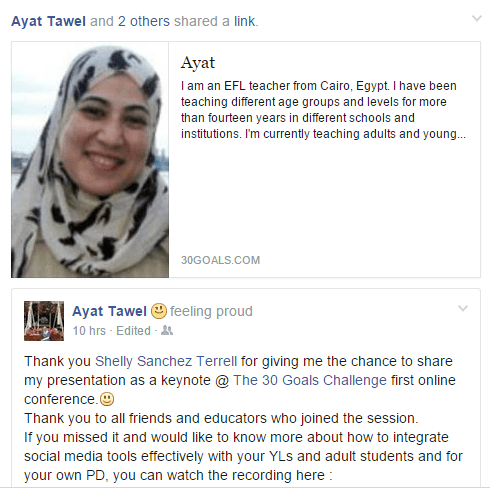 How has my experience of blogging for 30 Goals for Educators helped me learn more about myself, improved my writing and introduced me to dedicated educators from all over the world? This keynote will follow the journey of a middle school teacher in discovering what really matters most in teaching. When we complete challenges and develop as educators, we can see the result of our efforts in ourselves and our classes. But what would happen if we invited our students to take a challenge with us? Inspired by the 30 Goals Challenge for Educators, I asked students to join me in creating our video introductions to share with each other and the world. The idea, the interaction and the discoveries made our learning environment fun, engaging and safe and our journey even more worthwhile. This was our challenge. Social media is not about collecting likes and followers. It’s about connecting to make a difference (Cress, 2013). This session will demonstrate how to make that difference with your students and for your own professional development with social media tools such as; FB, Twitter, Edmodo, Google + and Pinterest. I will share my story of being a creative, engaged learner when I was young and then how I became compliant to “do” school to get through school. I just didn’t fit, but I found my purpose. I will share the importance of finding our voice so we can own and drive our learning.